Do you ever dream of a home in the country? 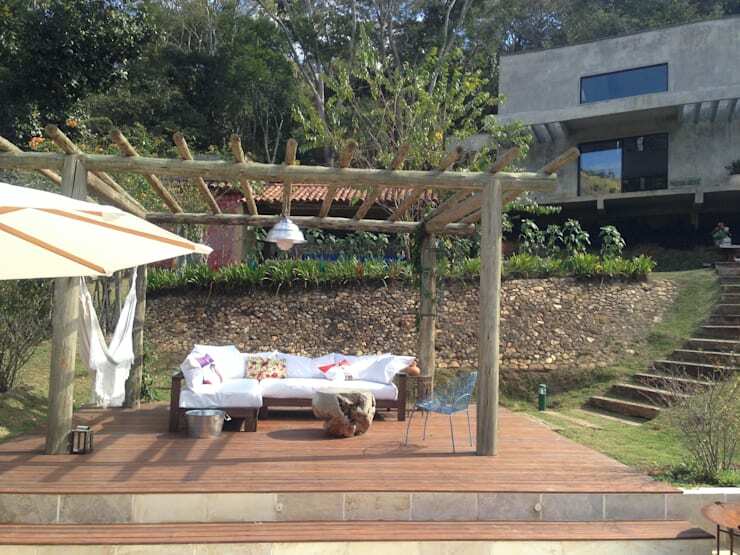 A place to which you could disappear for days or weeks to relax and unwind in casual comfort? 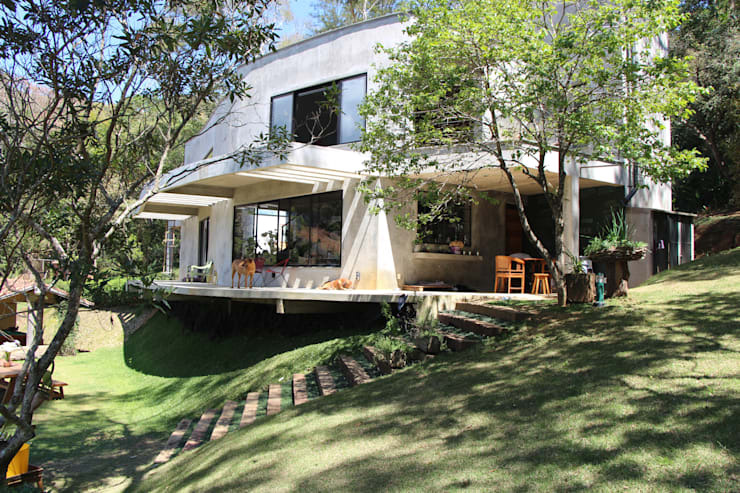 Well then this extraordinary abode, courtesy of Brazil's Carlos Salles Arquitectura, should provide plenty of inspiration! Situated on a rolling embankment and surrounded by nature's green, this home immediately intrigues, with its concrete construction exuding a relaxed, industrial air. 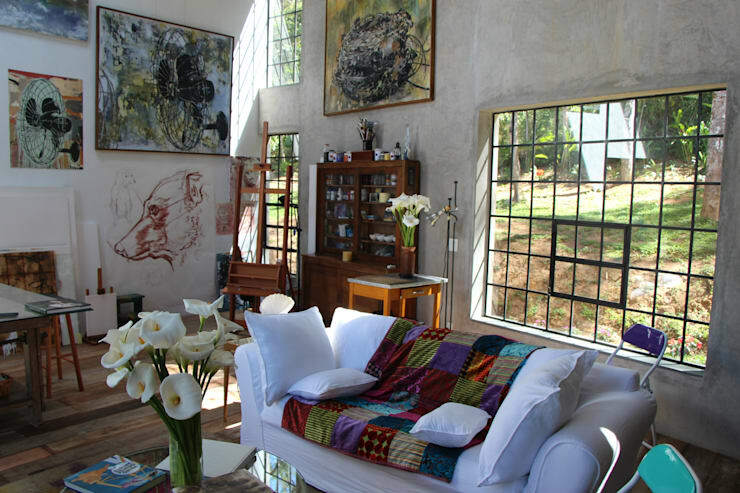 A curved facade softens the structure, and frames an open and inviting living area filled with artistry and eclecticism. 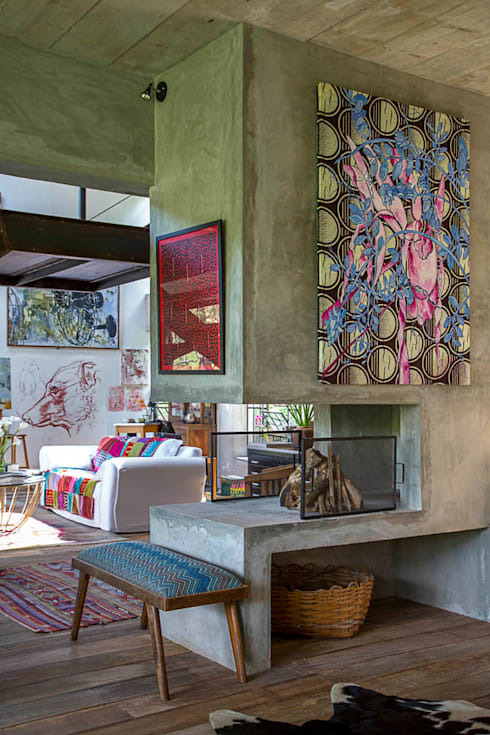 Paintings and drawings populate the walls, alongside an array of large windows, which invite light to fill the home and illuminate its contents. Comfortable furnishings in classic, vintage and country styles decorate the living room, while a contemporary fire place has been constructed in the centre of the ground floor, partially sectioning the living room from the kitchen and dining areas. The master bedroom oozes country appeal, with flowing timber panels constructing a rustic feature wall behind the bed, while the bathroom is decorated in colour-blocked tiles, and houses a large spa for a sense of modern luxury. This home is an absolute pleasure to behold, and is filled with a vivacious sense of character and style. Take a tour below and gain some ideas for your own ideal country getaway! From the outside this home oozes casual sophistication, with the curves of its concrete facade flowing out over a grassy embankment. A sheltered deck frames the exterior, with plenty of large windows also included, allowing a steady influx of natural light to permeate inside. The property appears wonderfully relaxed and inviting, with the concrete construction emitting an air of industrial style amidst its serene, rural locale. The eclectic design of the home's interior is truly impressive, with artwork in a range of styles populating its cool, grey walls, and a voluminous, white couch resting central, draped in a vibrantly coloured quilt. Around the couch we see an array of wooden furnishings that emanate a sense of country style, from the sturdy easel in the corner of the room, to its neighbouring, timber cabinet and stone-topped table. This view of the home's living room portrays the space in an irresistible light, with flowing, timber floors and eclectic array of both vintage and classic furnishings bathed in soft sunshine. Bordering the living area is a long, glass-topped table, presenting a space that doubles as a work area and locale for casual dining. The sheen of glass creates a beautiful contrast against the home's more subdued finishes of timber, textile and leather. While the plan of the home's ground floor remains relatively open, this partial wall of flowing concrete delineates the living room from the kitchen and dining areas, and also houses a contemporary fireplace. The open design of the fireplace optimises the heat emanating from within, and also allows for maximum ambient illumination after dark. 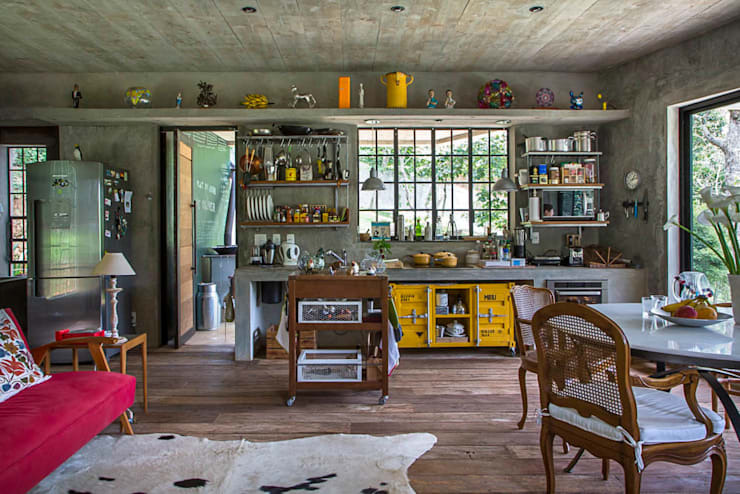 The home's kitchen presents a striking and inventive design, with the muted tones of its concrete surfaces enlivened through an array of bright objects. A cleverly-designed shelf skirts the top of the space, displaying an eclectic row of nic nacs, while a bright yellow cabinet has been incorporated within the kitchen bench, with its playful, artistic design mimicking that of a vibrant shipping container! 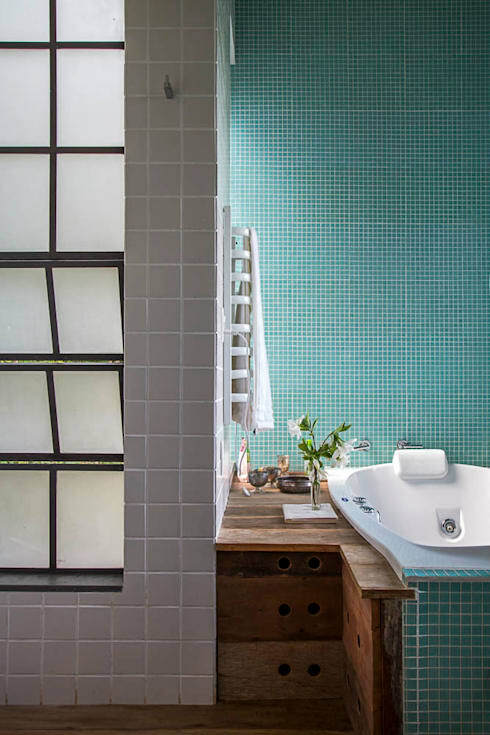 The bathroom is stylish and serene, decorated in a colour-blocked combination of grey and aqua tiles. A large spa bath has been included for a sense of modern luxury, but framed in rustic timber of dark brown, which exudes country style. The room is beautifully lit, with its array of frosted windows providing light, air and modesty. 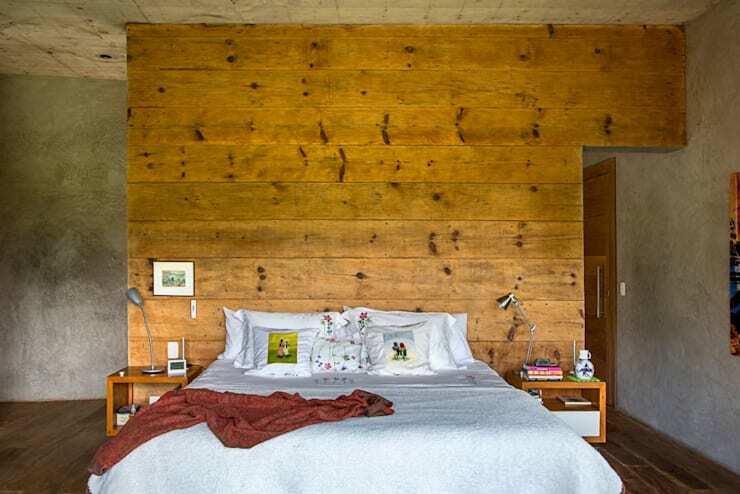 In the master bedroom we find reams of timber have again been employed to add a rustic edge to the space, with the caramel tones of woodgrain streaming across the rear of the room, creating an engaging feature wall. The smooth surface of the bedroom's grey concrete, rougher texture of its wooden panels and inviting softness of the bed combine to delightful effect, creating a pleasing sense of contrast. Moving outdoors and we find this beautiful deck has been included within the property's expansive garden, with its multi-tiered dais exuding tranquil appeal. A stylish lounge suite invites the occupants to relax and unwind amidst their picturesque surrounds, while a timber frame has been constructed overhead, presenting the possibility of shelter as the weather cools. 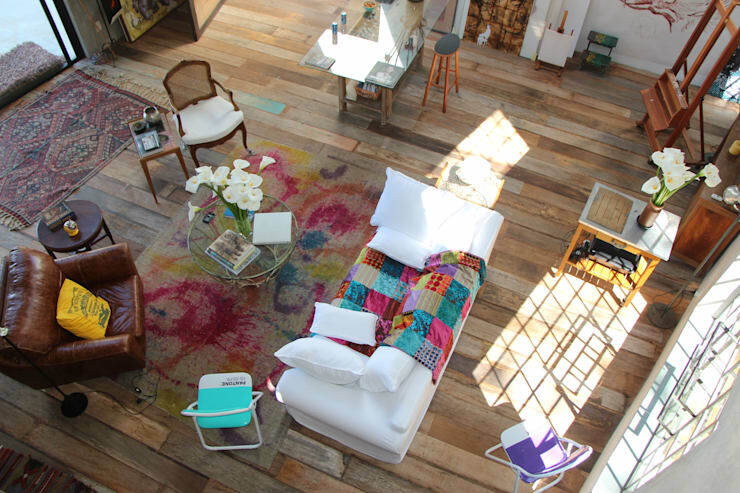 If you enjoyed the creativity and eclectic style of this home, you should take a tour of A Rustic and Luxurious Wooden Villa for more design inspiration! Do you enjoy eclectic interior decoration or do you prefer to stick to one style? Tell us below!